Mountain Lion’s Disk Utility is a handy tool for troubleshooting and repairing your MacBook’s drive. It’s a good place to start before moving to more difficult solutions. You can find it in the Utilities folder in Launchpad. Many Disk Utility functions can actually wipe your drives clean of data instead of repairing them! These advanced functions aren’t likely to help you with troubleshooting a problem with your existing volumes anyway. Fire up Disk Utility and click the First Aid tab to open the rather powerful-looking window. You can always tell a volume because it’s indented below the physical drive entry. The information at the bottom of the Disk Utility window contains the specifications of the selected drive or volume — things such as capacity, free space, and the number of files and folders for a volume, or connection type and total capacity for a drive. Because Mountain Lion is built on a UNIX base, lots of permissions can apply to the files on your drive — that is, who can open (or read or change) every application, folder, and document on your drive. Unfortunately, these permissions are often messed up by wayward applications or power glitches, or application installers that do a subpar job of cleaning up after themselves. And if the permissions on a file are changed, applications often lock up or refuse to run altogether. 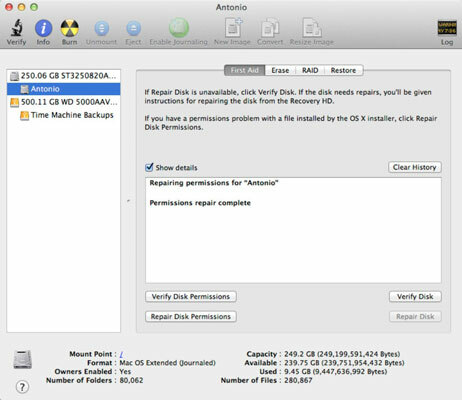 Consider repairing your disk permissions with Disk Utility once weekly. Make sure that you’re logged in with an admin account. Save and close any open documents. Click the Launchpad icon in the Dock, click the Utilities folder, and then click the Disk Utility icon — from the keyboard, press cmd+Shift+U. Click the volume that you want to check. Click the Repair Disk Permissions button. Don’t worry about verifying. If something’s wrong, you end up clicking Repair Disk Permissions anyway. Just click Repair Disk Permissions; if nothing pops up, that’s fine. To finish the process, always reboot after repairing permissions. By rebooting, you see whether the problem has been corrected! 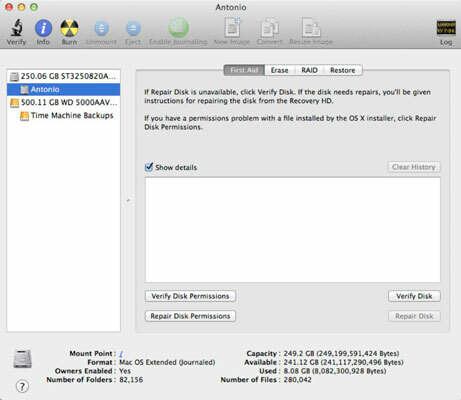 Disk Utility can check the format and health of both drives and volumes with Verify Disk — and, if the problem can be corrected, fix any error by using Repair Disk. You can’t repair the boot drive or the boot volume. This limitation actually makes sense because you’re using that drive and volume right now. To verify or repair your boot drive, boot your MacBook from the OS X Recovery HD volume. Reboot and hold down the cmd+R keyboard shortcut immediately after you hear the start-up chord, and then run Disk Utility from the window that appears. Because you’ve booted your laptop from the Recovery HD volume, you can verify and repair problems with your start-up drive. You can’t repair CDs and DVDs. CDs and DVDs are read-only media and thus can’t be repaired (at least by Disk Utility). If your MacBook is having trouble reading a CD or DVD, wipe the disc with a soft cloth to remove dust, oil, and fingerprints. Should that fail, invest in a disc-cleaning contrivance of some sort. Click the Launchpad icon in the Dock, click the Utilities folder, and then click the Disk Utility icon (or press cmd+Shift+U). In the list at the left side of the Disk Utility window, click the drive or volume that you want to check. Click the Repair Disk button. If changes were made (or if you had to boot from the OS X Recovery HD volume), reboot after repairs have been made.